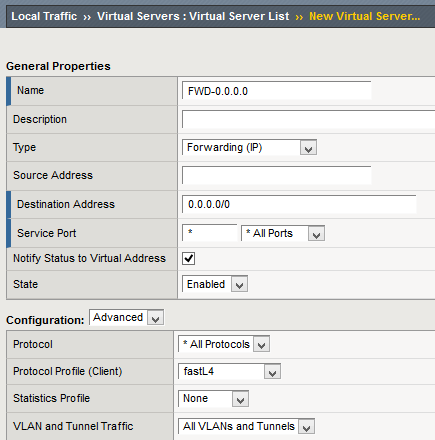 This post is an example of configuring an IPsec tunnel with F5 BIG-IP. In the diagram below the IPsec tunnel is configured between SRX210 (Junos 12.1X47-D20.7) and F5 BIG-IP (11.6.0 HF5-ENG11). F5 BIG-IP is connected here in one-arm setup. The SRX240 is not “an interesting device” in this demonstration. It is just a firewall and a router in the site LAN. 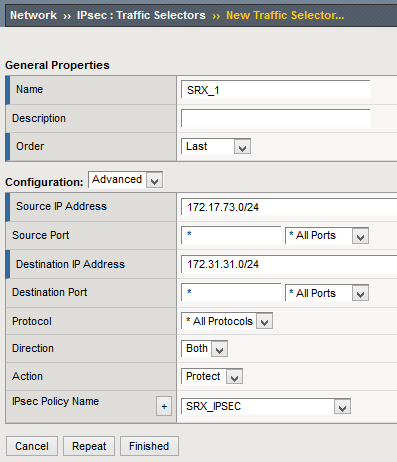 The public IP address of the F5 BIG-IP (198.51.100.10) is routed normally in the SRX240, there is no NAT for that connectivity. F5 BIG-IP uses SRX240 as the default route next hop. 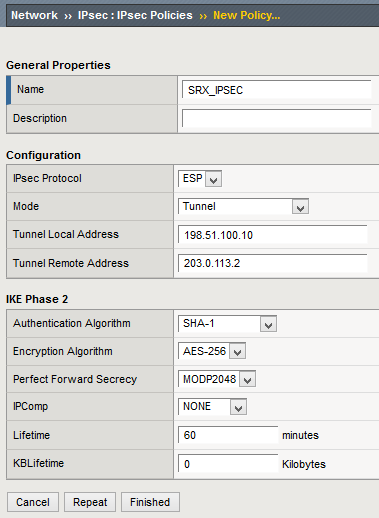 set interfaces st0 unit 2 description "IPsec tunnel to F5"
This IPsec configuration uses traffic selectors as described in my earlier post. Why is this needed? Because the traffic coming from 172.17.73.0/24 and going to 172.31.31.0/24 would otherwise be routed to the Internet (via the default route) on SRX240. This static route directs it to the BIG-IP for IPsec encapsulation. So this is just a basic routing configuration. Perfect Forward Secrecy: F5 uses the MODP syntax for specifying the DH groups. MODP2048 = group 14. 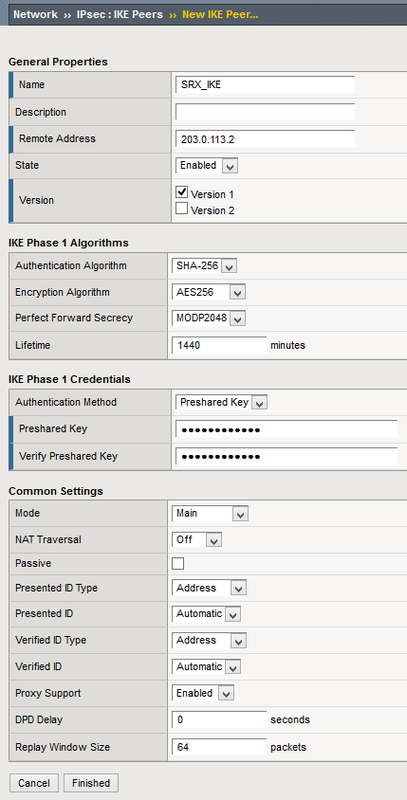 See for example Internet Key Exchange (IKE) Attributes from IANA for the full list of DH groups. Lifetime: This is minutes, not seconds. 1440 minutes = 86400 seconds. Again, the time-based lifetime is entered in minutes, not in seconds. You may want to customize it as you need. The purpose of this virtual server is to enable BIG-IP to process and forward the incoming packets as the BIG-IP is now basically used as a router. 2015-07-12 16:43:55: INFO: begin Identity Protection mode. 2015-07-12 16:43:55: WARNING: SPI size isn't zero, but IKE proposal. 2015-07-12 16:43:55: WARNING: ignore INITIAL-CONTACT notification, because it is only accepted after phase1. Clearly there is something wrong. Since SRX said “Remote IKE-ID: 127.0.0.1” something has to be done in BIG-IP. 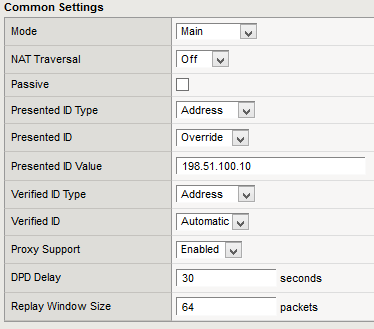 Select Override in Presented ID and enter the system’s own IP address (actually the cluster IP address as this is a device cluster) in the value field. Jul 12 16:55:45 srx210 kmd VPN instance-GT-F5_TS_1_268173315 from 198.51.100.10 is up. Local-ip: 203.0.113.2, gateway name: GW_F5, vpn name: GT-F5_TS_1, tunnel-id: 268173315, local tunnel-if: st0.2, remote tunnel-ip: Not-Available, Local IKE-ID: 203.0.113.2, Remote IKE-ID: 198.51.100.10, XAUTH username: Not-Applicable, VR id: 0, Traffic-selector: TS_1, Traffic-selector local ID: ipv4(172.31.31.0-172.31.31.255), Traffic-selector remote ID: ipv4(172.17.73.0-172. 2015-07-12 16:55:45: INFO: begin Identity Protection mode. 2015-07-12 16:55:45: WARNING: SPI size isn't zero, but IKE proposal. 2015-07-12 16:55:45: WARNING: ignore INITIAL-CONTACT notification, because it is only accepted after phase1. F5 BIG-IP does not need any specific IKE/IPsec virtual server configured to be able to terminate IPsec tunnels. Some of the IPsec configuration details are expressed in different style in BIG-IP, like the lifetimes (minutes instead of seconds as is more common) and the DH groups. Nevertheless, the IPsec configurations are quite similar in all devices. “The Traffic Management Microkernel (TMM) may produce a core file and restart during failover due to invalid memory access in IPsec components. Your BIG-IP system has an IPsec tunnel enabled. The system is a member of a high-availability pair. In 11.6.0 HF5 this is still unresolved but engineering hotfix is available from F5 support. In 11.5.x the issue has already been fixed in 11.5.3. This is a nice write-up of an issue I’ve observed elsewhere as well. Thanks!